You are here: Virgin Islands News Online » News » Where will the 2018 Tortola festival be held? Where will the 2018 Tortola festival be held? ROAD TOWN, Tortola, VI- A few weeks ago the Minister for Education and Culture Hon Myron V. Walwyn (AL) told a local radio station that the 2018 August Festival on Tortola will happen. However, it remains unclear where the village set up, that includes the stage, the booths and the end of the parade activities, will be. 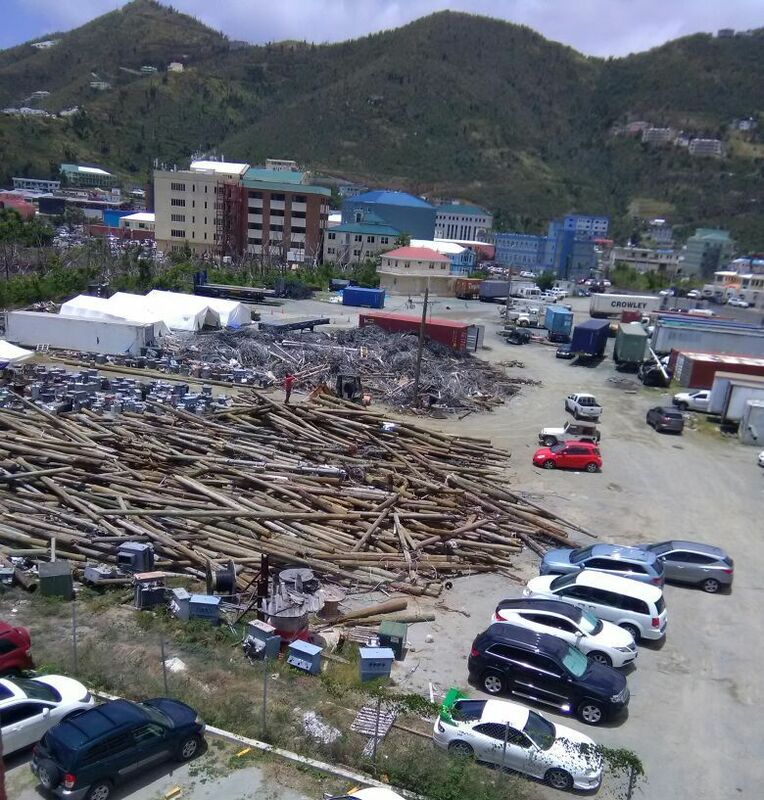 Following the destructive Hurricanes of September 2017, the Festival Grounds in Road Town has been occupied with relief supplies, heavy equipment, along with material belonging to the BVI Electricity Corporation (BVIEC). It could be challenging to have all the items removed in time for July 2018, which is a few weeks away, to set up the Festival Grounds where booths are built and the stage is set up. The 2018 Hurricane season will start next month, June, and run to November 2018, and predictions are that will be another active one. City Manager Janice E.L. Braithwaite-Edwards said a few weeks ago that there were efforts underway to clear up the Festival Grounds; however, she could not be reached today May 6, 2018 for an update. As far as the telephone poles go, many people need to replace fencing but can’t afford the poles. Why don’t government allow each family to go with some and the yard would clear out so fast. Selling them will take too long. I was thinking the same thing on Friday as I drove by the field. I need fencing around my property right now. Most of that lumber an be recycled, in fact many of the debris from the storms could be. We need to form a recycling committee. It should be a time for songs, praises, giving thanks and reflections to the most high God, what festival are we really talking about. What will it take for us to learn. While I agree that songs of praise should be sung, what are you suggesting should happen? Should religion be forced down the "non-believer's" throat? I understand that Christians, like Christ, should preach the word, but the acceptance and belief in/of the word is up to the person hearing it. We all choose our faith. The church started festival in the BVI. While it might not look the way it did at its inception, maybe, just maybe if the church stepped in to show and restore the way we should celebrate Emancipation from slavery, then perhaps the community might learn to live in harmony instead of being so divided ALL THE TIME. Your comment is evidence of yet another great divide. Why couldn't your comment have been one suggesting a way of unity as we celebrate? Well, non-believers have forced down their agenda in our land for years, forcing us to use our taxes to fund their type of festivals. We think it’s time for the church to have a voice. The problem is that there is no swaying the lines with God. The festival would have to be 100% righteous but righteous Festivals don’t often attract the world. However one thing remains clear...We Christians Have To Stand Up This Time cause we all know...Our Lord Is Talking! There is lot of space near the Tortola Pair Park. 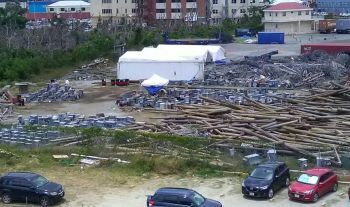 The village can be temporary relocated in all that open space that people park next to the Tortola Pier Park. Just a suggestion. I wondered the same thing this while looking at the pile of rubble. It don’t need to have none. God is keep warning and warning and warning us as a nation, country and individual to sincerely repent and turn from our wicked ways and truly serve and give him the praise and glory he deserve so that our land can be heal. BVI we need to wake up!!!! God is not mock. He is a jealous God. BVI God is keep warning us. Have mercy Lord, have mercy on us the people of the BVI!!!!! Cancel the Festival, it no longer promote the love of God for the abolishment of slavery but the promotion of one’s flesh and ‘the spirit of whoredom’ ...because of this evil it has brought a plague upon our nation. Too much fake love for God. Too much Fake love for people that's our problem... That's why we are paying with destruction after destruction. Too much fake people pretending to be what they are not.. Leave festival alone.. Just do what you know is right..
...and this is why my nation needs healing and addressing this ungodly festival is a huge step forward. This is what me and many others know is right. You crazy for ndp to go back? Our Festival needs to happen. Hurricane Irma and Maria’s were natural disasters and they have nothing to do with religion. We need to move on and rebuild our islands. It’s challenging now but we will rise up. All these religious rants are unnecessary and these so called Christians need to stop judging others. Irma was NOT!!!! an ordinary hurricane. Irma was a judgement to the BVI my God!!! He has been warning us from long and we fail to take heed. After the hurricane and to this day he is still send warning to us the people of the BVI!!! What will it take for us to repent and get right??? God is not mock and we need to get right or we will get left!!! God have mercy on us!!! Many of you will not learn until the flood waters parts and then closes in on you... as for me and my house we will follow the Lord. As far as I am concern, they should cancel the whole festival this year. It is not a big deal. You forgot to mention the open sewage that has saturated the grounds and that the soil needs to be dug up and exposed of before it causes sickness and diseases. I think it is time for God’s church to take back Festival and stop sleeping! Have it on ESHS grounds. Same old dirty business as usual, the spiritual stench of this festival has overflowed into its central location and the ground is saturated with sewage. Even if they removed all the debris at the Festival Grounds it still remains unclean at and below its surface. Moreover, it is a great health hazard. So it is in the spiritual, as it is in the physical! Amen! You hit the nail on the head. The BVI is in the grip of evil, there is greed and selfishness in the political and religious leaders, in the employers and employees, in the voters and ordinary residents. This evil is visible in the poor performance of our school and college graduates, in the disrespectful behavior in our youth, in the failure of the churches to make a positive difference in people, in the litter and garbage that people scatter and refuse to clean up, in the poor state of our roads and public facilities. Only the British, as an outside neutral force can save us. That is scary since 1834 was so far behind us. May God have mercy on us all.